PRESS RELEASE: Following the April release of the iElectribe virtual analog beatbox for iPad, which continues to be a top seller at the iTunes store, Korg has unveiled a new app based on classic Korg synth instruments. The new, intuitive Korg iMS-20 application transforms users' iPads into complete analog synth studios with a detailed recreation of the legendary Korg MS-20 semi-modular analog synth, along with a built-in 16-step analog sequencer, based on the Korg SQ-10. A variety of additional new features, including an analog drum machine, mixer, dual Kaoss pads and direct access to SoundCloud online distribution, makes this application ideal for electronic musicians. Ever since the launch of the MS-20 in 1978, this distinctive monophonic synthesizer has enjoyed unbroken popularity for its thick and solid sound, aggressive analog filters and inexhaustible potential for creative patching. Using Korg's proprietary CMT (Component Modeling Technology) the iMS-20 completely replicates every aspect of the legendary MS-20: the two Voltage Controlled Oscillators, Voltage Controlled Filters, two dynamic Envelope Generators and a Voltage Controlled Amplifier. iMS-20 also features high-pass/low-pass self-oscillating filters with the same unique distortion elements that made these filters popular back in their day, and still coveted today. The Korg SQ-10, also introduced in the late 1970s, is effectively recreated for the iMS-20 app. Featuring 16 steps, this analog sequencer can produce either a series of pitches or create a cyclic pattern of control changes to the volume, panning, filter brightness and other synthesizer parameters. The iMS-20 version also includes new improvements not found on the original, such as easy control of notes, volume, pan, or synth/effect parameters. All of the SQ-10's classic and unique functionality, such as three channels of voltage control and six types of sequence modes, is also included. In addition to being a complete electronic music production studio, the iMS-20 can function as a dynamic performance instrument as well. It is equipped with dual Kaoss pad control surfaces - one for note creation as made famous by Korg's Kaossilator, and one for manipulating parameter values in real-time, as found on Korg's Kaoss series of effects processors. Users can share their creativity via the SoundCloud integration feature. SoundCloud provides a way to publish songs or to collaborate on new music with friends anywhere in the world. Audio data exported by the iMS-20 app can be quickly published and shared, and users can access the SoundCloud server right from within iMS-20. 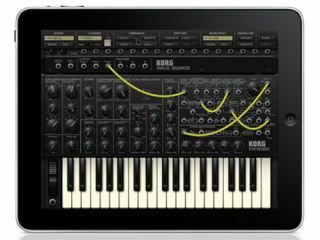 The Korg iMS-20 for iPad is available for download purchase from Apple's App Store (inside the iTunes Store) for a special introductory price of $15.99 (USD) until 31 January, 2011, after which point the app will be available for the regular price of $32.99. For more information, including a full list of iMS-20 specifications, please visit www.korg.com/ims20 or www.korg.co.uk/ims20 (NOTE: neither of these URLs are working at time of publishing).